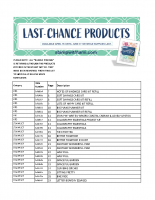 Select products from the 2019 occasions catalog and 2018–2019 annual catalog are retiring—and this is the last chance for you and your customers to get them! Check out all the details below. Visit my online store for discounts. 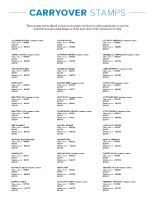 Carry Over Stamps List: These stamps will be offered in clear-mount and/or wood-mount while supplies last or until the 2019-2020 annual catalog begins, at which point they will be transitioned to cling. 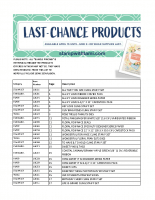 Customers who qualify for a free catalog April 1-25 will be in the 1st round of shipping on May 6 direct from Stampin Up. If you qualify after April 25, your new catalog will ship the end of May. Retiring Accessories are “while supplies last” (everything but stamps) Selling out fast. Demonstrators can begin Pre-ordering Products from the new Catalog, and will receive the new catalog in with your order. May 24: Retiring Stamp Sets go “While supplies last” and may sell out. I’ll be shipping the new catalogs on 2 dates depending on when you purchase, or qualify for your copy from me. Order placed April 26 – May 31 (2nd Round): new catalogs will ship the end of May. If you don’t have a demonstrator, and don’t qualify for a free catalog please fill out this form to request your catalog. The cost of the annual catalog is $7 (this is to cover my shipping costs). These are 200+ big catalogs and idea books, and I purchase these and pay to ship them. I offer them to you for free, I charge $7 to cover my shipping costs. Love this new product. Can’t wait to see the new catalog. Thanks for sharing. Love the Magnolia set and the birds DSP! Can’t wait. Thanks for the preview!! Lots of great stamps to look forward to. Thanks Tami for the preview! 💘 love all the new things. Can’t wait to get the new catalogs.